It is important to choose a lucrative tariff plan for outgoing calls for profitable termination of GSM traffic in Ecuador. The mobile sector is well developed in this Latin American country and there are two large competing each other operators – Claro and Movistar. Claro has been a leader in the local cellular market for the last several years. The international telecommunications company America Movil operates under the Claro brand in Ecuador. This operator has the best coverage in the country, especially in remote areas. In 2015 the company launched 4G networks in the large regions. Prepaid SIM-card Claro costs 7$, herewith you immediately get 3$ on the balance. According to the law, in order to buy a start package you need to be a local citizen, but in practice, sim-cards can be bought from merchants on the street or in small booths, where they will be activated under a false name. 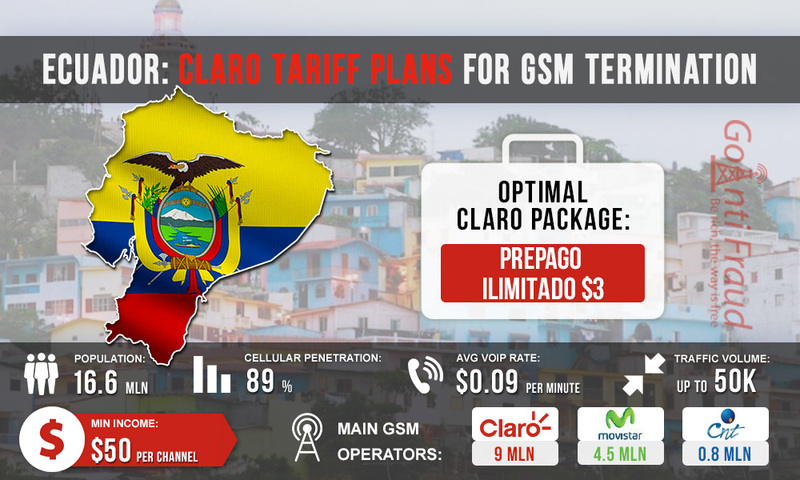 Claro offers to the subscribers several prepaid packages (Prepago), which include voice bonuses, SMS and mobile Internet. ● Diario (the cost is 1 dollar). The subscriber receives 30 free minutes for calls to Claro numbers. ● Ilimitado $3. It is possible to call without restrictions within the network. ● Ilimitado $6. Provides unlimited calls to all operators’ numbers. The optimal prepaid package for termination with VoIP GSM gateway is Ilimitado which costs $3. New SIM cards will have to be used daily, because with a large number of outgoing calls, numbers will be quickly blocked. Buying sim-card for $7, you immediately get 3 bonus dollars on the account, which can be used to connect the tariff plan Ilimitado for $3. Thus, you will spend $4 daily for each channel of equipment. Terminating 5 hours a day and believably simulating the activity of a real subscriber on the network, you will be able to receive income about $450 (from one channel of your VoIP equipment).